Going to the Performing Garage on our yearly trips to see the Wooster Group has started to feel like a pilgrimage. We’re visiting a place where the memorials are carved out of video and drollery, a graveyard where the gravestones dance. In the program note for A Pink Chair (In Place of a Fake Antique), director Elizabeth LeCompte says that the company’s work has always been “absorbed with conjuring ghosts and shadows from history”—and certainly, the Woosters love paying homage to other artists’ oeuvres. The experimental-theater titans taught themselves to dance for the Jerzy Grotowski–meets–William Forsythe work Poor Theater; they acted out a version, complete with fast-forwarding, of Richard Burton’s filmed Hamlet. Indeed, avant-garde ventriloquism is their métier. 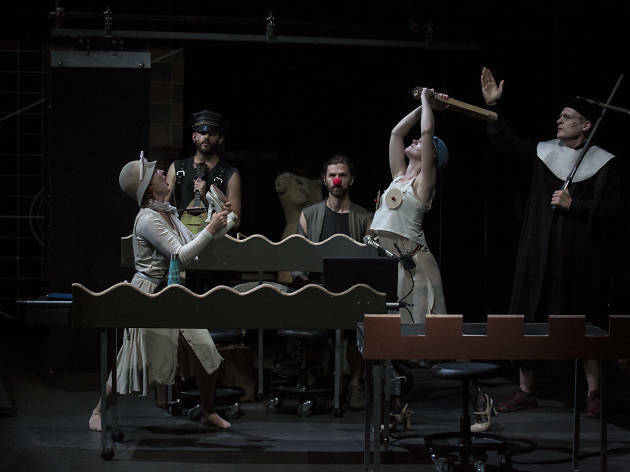 After nearly forty years of theater-making, the marker of a Wooster performance is the abstracted look the actors get as they juggle their lines, complex choreography, in-ear microphone prompts and multi-channel video cues. The actors are always listening to some call we can’t hear. Their eyes look where we can’t follow. This time the Woosters have answered a call by the Adam Mickiewicz Institute to make a piece about the Polish director Tadeusz Kantor, whose work was featured at La MaMa several times in the ’70s and ’80s. Kantor made black-edged work, in which props and mannequins stood in for people and people stood in for the dead. His 1979 piece Dead Class—a beautiful film of it is on YouTube—inspired LeCompte early on, and you can see an exact intermeshing happening in A Pink Chair as the Woosters imitate one of their aesthetic forebears. This overlap, though, is also the show’s weakness. Yet it’s still a delight to watch. The video is a superb document of a vanished artist, and for a while it seems best to simply ignore the Woosterian hijinks and watch the TV. But at the end there’s a dessert that’s worth the meal. 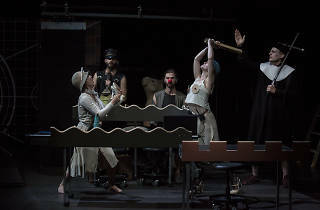 In its final ten minutes, the performance turns silly and strange and moving: To portray the play The Return of Odysseus from Kantor’s catalogue, the group gets dressed up like brightly colored wooden dolls, mounts a pretend ship and sings the hymn “Bound for the Promised Land.” Bang! The terms of the show have changed, and the piece’s memorializing power comes swinging down like an axe. We can’t see Kantor’s company, because the video has gone away, and we’re not being asked to measure the Woosters against the master anymore. Are they doing it right? Is this what it looked like? We can’t tell. The Woosters seem abruptly lonely, even absurd; they’ve turned into misfit toys. How scary the ocean is when the captain is gone. And Kantor is really gone; he’s gone forever. The Woosters drift in their little boat, but as hard as they might sing, his hand will never take the wheel. Performing Garage (Off Broadway). By the Wooster Group. Directed by Elizabeth LeCompte. Running time: 1hr 10mins. No intermission.